Andrew Klaven: Why is it ... that left-wingers feel free to make their films direct and realistic, whereas Hollywood conservatives have to put on a mask in order to speak what they know to be the truth? Zizek: What I despise in America is the studio actors [sic] logic, as if there is something good in self expression: do not be oppressed, open yourself, even if you shout and kick the others, everything in order to express and liberate yourself. This stupid idea, that behind the mask there is some truth. .... Surfaces do matter. If you disturb the surfaces you may lose a lot more than you account. You shouldn't play with rituals. Masks are never simply mere masks. There are many symptomatically interesting things about the right wing attempts to appropriate The Dark Knight that are doing the rounds at the moment. The idea is that the Batman of the film equals Bush - a misunderstood hero prepared to make 'tough choices' in order to protect an ungrateful population from threats it is too ethically enfeebled to confront. In a couple of intricately argued posts, Inspersal demonstrates that The Dark Knight by no means presents 'tough choices' as 'hard but necessary'; on the contrary, whenever Batman resorts to torture, it either yields nothing or is counterproductive. What neocon readings of the film must overlook is that this is exactly the same in geopolitical reality: far from being unpalatable but necessary, the Iraq misadventure, Guantanamo Bay, extraordinary rendition etc have either achieved no results or made things worse. What's interesting here is the doggedness of the neocon fantasy, which is precisely a fantasy of 'being realistic' - astonishingly, elements of the American right appear to actually still believe that the Bush admininstration's policies are successful, and that the American public has rejected them on the grounds of highminded (liberal) ethical qualms rather than for pragmatic-utilitarian reasons (too many of our boys being killed). Secondly, what these readings also miss is the actual nature of the model of virtue presented in the film. If this is (neo)conservative, it is not at the simple level of utilitarian calculation of consequences. What we are dealing with is a far more complicated Straussian meta-utilitarianism whose cynical reasoning is akin to that of Dostoyevsky's Grand Inquisitor. Deception - of the masses by the elite - is integral to this account of virtue: what is 'protected' is not the masses' security but their belief (in Harvey Dent's campaign). As Inspersal argues, the emphasis on deception in The Dark Knight is one of the themes that connects it with Nolan's previous films, and Batman's climactic act of self-sacrifice is precisely an act of deception. It takes place at the level of signs: what he must give up is his reputation, his good standing in the eyes of the Gotham public. The act of deception doesn't conceal an underlying good act - it is the concealing that is the good act itself. Thirdly, the neocon readings misconstrue the nature of 'evil' in the film. If these rightwingers really think that Osama bin Laden is like The Joker as he appears in The Dark Knight, that gives us another, intriguing, insight into their fantasies. (Matthew Yglesias says, "I look at the movie and say 'see -- if you were fighting a comic book bad guy and you were a comic book hero then your policies would make sense.'" But even this isn't the case, as Inspersal's arguments above make clear.) Or rather, it reveals the inconsistency on which Islamophobic fantasy depends: the Islamist is both "an agent of chaos", someone without a cause, and a zealot excessively attached to a cause. You see, nobody panics when things go according to plan. Even if the plan is horrifying. If I told people that a gangbanger was going to get shot, or a busload of soldiers was going to get blown up, nobody would panic. Because it's all part of the plan. But tell people that one tiny little mayor is going to die and everyone loses their minds! 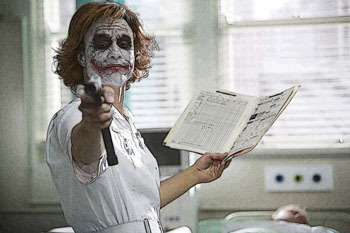 Introduce a little anarchy, you upset the established order, and everything becomes chaos. I am an agent of chaos. 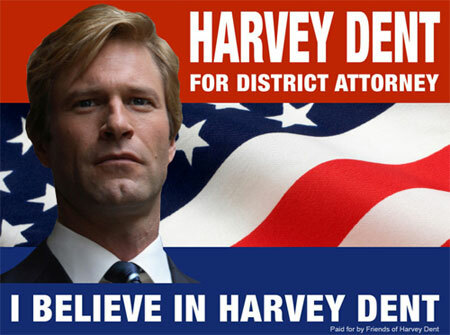 And you know the thing about chaos, Harvey. It's fair. While Batman is drawn into utilitarian calculations, The Joker is free in the same way that the death drive is free: he acts with indifference to consequences, glorying instead in a kind of ungrounded unbinding of orderly causal sequences. The reference to "fairness" above is not idle. As an imp of the perverse, The Joker stands for an inverted (or freaked) Kantian justice. In many ways, we are looking at the reversal of Kantianism into Don Giovanni Zizek has described many times (Don Giovanni's decision not to save himself, to maintain his commitment to his libertinism even when doing so will result in his execution, becomes an ethical gesture). The Joker acts without any pathological interests, grandly symbolising his lack of instrumentality with the burning of the pyramid of money. Two-Face's insanity is also a kind of haemorrhaging of justice. In his case, the championing of a good cause - which it seems will inevitably leads to terrible consequences - is displaced by an embrace of chance's random causality (heads/ tails). The flip into randomness is not an abandonment of justice, but the quest for a justice that will not be corrupted by human will - in its very impersonal mechanism, chance is fair because it does not privilege any outcome or any individual. Interestingly, it is only when Dent becomes Two-Face that his coin tossing is fair; when Dent is the "White Knight" DA, his coin is loaded (it has heads on both sides). What also interrupts the orderly sequence of causality in Dent's case is trauma - the trauma of seeing Rachel die, which is itself a consequence of a binary choice trap, one of a series of such traps The Joker attempts to spring. The by now standard view of The Dark Knight - that its real libidinal pull is not the peripheral Batman/Wayne, but the charisma of Heath Ledger's Joker - is certainly correct. When I heard Ledger's performance celebrated, I feared the worst: that we were going to see the actorly overplaying that usually garners this kind of ubiquitous praise. But it is to Ledger's immense credit that he completely avoids what Nicholson was allowed to do in Tim Burton's dreadful Batman: we get no glimpse of the actor behind the role (with Nicholson, of course, that's all we got). There is also no question of Ledger appearing bare-faced for any significant length of time, as Tobey Macguire and Julian McMahon were allowed to in Spider-Man 3 and the Fantastic Four films respectively. Thankfully, there is only the briefest glimpse of The Joker sans make-up in The Dark Knight. What Ledger does, in many ways, is play the make-up. I should stress here that the make-up, which makes Ledger's face look like a malevolent monkey leering from behind cracked plaster, manages a feat that is near impossible: it reinvents The Joker look whilst also maintaining fidelity to the comics (compare the Green Goblin's mask and outfit in the Spider-Man films, whose divergence from the halloween hood in the comics always disappointed me). My one point of disagreement with Inspersal concerns his claim that Ledger's performance "shows the Nicholson/Burton interpretation to be much closer to Cesar Romero from the TV show, rather than Alan Moore's version from The Killing Joke, allegedly Burton and Hamm's chief influence". I would argue in fact, that it is Ledger's performance that is closer to Romero's, and that is why it works so well. Nicholson's pomo posturing and Moore's psychological depth were all of a piece, and both were far less terrifying than the senseless gibbering of Romero's pantomime-turn Joker. The Joker was always fascinating because, unlike most if not all big-time supervillains, he was pure surface, motiveless madness, devoid of any origin or backstory - until Moore obligingly filled one in, as his hamfisted pseudo-literary wont. There are a couple of great scenes in The Dark Knight where Ledger's Joker mocks cod psychoanalytic reduction: "See these scars... I got them because of my father." "See these scars... I got them because of my wife." (This reminded me of nothing so much as Ian Bannen's chilling burst of explosive laughter in Sidney Lumet's The Offence, in response to Sean Connery's question: "Was your father a big man?") If The Joker aligns himself with anything it is 'the freak', which cannot but remind us of freak events, that is, events which appear to happen without proper causation. By evacuating The Joker of all interiority, by refusing anything which would contain the Joker's wildness or compromise the autonomy of his facepainted persona, Ledger's performance (and Jonathan Nolan's script) do justice to the freakish.